Neutron scattering analysis performed at DOE's Oak Ridge National Laboratory reveals the lamellar structure of a hydrogen-producing, biohybrid composite material formed by the self-assembly of naturally occurring, light harvesting proteins with polymers. Photosynthesis, the natural process carried out by plants, algae and some bacterial species, converts sunlight energy into chemical energy and sustains much of the life on earth. Researchers have long sought inspiration from photosynthesis to develop new materials to harness the sun's energy for electricity and fuel production. In a step toward synthetic solar conversion systems, the ORNL researchers have demonstrated and confirmed with small-angle neutron scattering analysis that light harvesting complex II (LHC-II) proteins can self-assemble with polymers into a synthetic membrane structure and produce hydrogen. "Making a, self-repairing synthetic photoconversion system is a pretty tall order. The ability to control structure and order in these materials for self-repair is of interest because, as the system degrades, it loses its effectiveness," ORNL researcher Hugh O'Neill, of the lab's Center for Structural Molecular Biology, said. "This is the first example of a protein altering the phase behavior of a synthetic polymer that we have found in the literature. This finding could be exploited for the introduction of self-repair mechanisms in future solar conversion systems," he said. Small angle neutron scattering analysis performed at ORNL's High Flux Isotope Reactor (HFIR) showed that the LHC-II, when introduced into a liquid environment that contained polymers, interacted with polymers to form lamellar sheets similar to those found in natural photosynthetic membranes. The ability of LHC-II to force the assembly of structural polymers into an ordered, layered state -- instead of languishing in an ineffectual mush -- could make possible the development of biohybrid photoconversion systems. 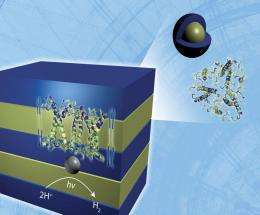 These systems would consist of high surface area, light-collecting panes that use the proteins combined with a catalyst such as platinum to convert the sunlight into hydrogen, which could be used for fuel. The research builds on previous ORNL investigations into the energy-conversion capabilities of platinized photosystem I complexes -- and how synthetic systems based on plant biochemistry can become part of the solution to the global energy challenge. "We're building on the photosynthesis research to explore the development of self-assembly in biohybrid systems. The neutron studies give us direct evidence that this is occurring," O'Neill said. The researchers confirmed the proteins' structural behavior through analysis with HFIR's Bio-SANS, a small-angle neutron scattering instrument specifically designed for analysis of biomolecular materials. "Cold source" neutrons, in which energy is removed by passing them through cryogenically chilled hydrogen, are ideal for studying the molecular structures of biological tissue and polymers. The LHC-II protein for the experiment was derived from a simple source: spinach procured from a local produce section, then processed to separate the LHC-II proteins from other cellular components. Eventually, the protein could be synthetically produced and optimized to respond to light. O'Neill said the primary role of the LHC-II protein is as a solar collector, absorbing sunlight and transferring it to the photosynthetic reaction centers, maximizing their output. "However, this study shows that LHC-II can also carry out electron transfer reactions, a role not known to occur in vivo," he said. The research team, which came from various laboratory organizations including its Chemical Sciences Division, Neutron Scattering Sciences Division, the Center for Structural Molecular Biology and the Center for Nanophase Materials Sciences, consisted of O'Neill, William T. Heller, and Kunlun Hong, all of ORNL; Dimitry Smolensky of the University of Tennessee; and Mateus Cardoso, a former postdoctoral researcher at ORNL now of the Laboratio Nacional de Luz Sincrotron in Brazil. "That's one of the nice things about working at a national laboratory. Expertise is available from a variety of organizations," O'Neill said. More information: The work was published in the journal Energy & Environmental Science. One never knows when America will awaken, deciding that action/Now, is vastly preferable to 'the lights going-out! Current turmoil not-excepted, just imagine the 'hoards' of workers that will be employed with deployment of this and corollary research which may be 'nearing fruition' as well! Many minds toil incessantly, without benefit of the 'bottomless' expertise afforded Scientists in Fed-Funded-Labs . . . I am satisfied USA has the 'brain' and 'braun' for success of such efforts . . . One must bear in mind, that the Longest Journey, still begins with a 'Single Step'! The Wright Brothers were not testing a '747'! Would, that the USA have the temerity to 'Step'! 'Braun' (to be more precise Wernher von Braun and people like him - i.e. captured/foreign scientists) is why America _seems_ to have the brain it does. Having been there for a few years and having experienced the 'benefit' of the US education system I highly doubt that the US, left to its own devices in a crisis, would have the brain to pull much scientific weight. Our geniuses are brilliant despite their educational handicap. Besides, science in most forms is not constrained by borders but by engineering ability. The US has had a major engineering advantage over the world. That advantage is what is on the decline and will eventually result in the declination of the US on the world superpower stage. Our geniuses are brilliant despite their educational handicap. Check the names on most papers cited here which come from US universities. You'll find a disproprtionate amount with chinese names which are most likely just there to get a PhD and then go back. Certainly more than the average percentage of naturalized americans of chinese descent would indicate. Do you really think you're going to go far with that? Perhaps we can reduce the epidemic global obesity by converting food production infrastructure to fuel production? I saw we offer everyone free lypo and convert the fat to fuel. nah, the idea is to split water, which starts by reducing (giving an electron) elemental hydrogen on the surface of the wafer. And you are exactly right, that is not impressive. The difficultly in splitting water comes from harnessing enough energy to do both the hydrogen reduction (E=0) and the water oxidation (stripping of 4 electrons and consequently combining two oxygens into the diatomic gas [E=4*1.23 eV]) I think the main point here is just that they have combined a biohybrid composite material, and it "works". Works being in quotes because it does not really make any practical sense, as reducing hydrogen in water is about as easy as it gets. optimists,sceptics..either way an advance in science is an advance in science..The application of this idea to practical useage will depend on the championing of thisnot so small step to its conclusion..Perhaps paint on the side of a building with channels built in to collect the hydrogen which would have a tendancy to float uppwards based on the lightness of this gas to be collected on a rooftop structure that would burn it off at certain set points to generate useful heat energy to drive a turbine system that could help the electricity balance of the building...etc...Larger surfaces such as highways,sidewalks,parking lots etc could also come in to play...That i think is a key to future development of any technology,the play factor. True. Its just that there are already many other ways to convert solar to hydrogen, and they work MUCH better. (TiO2, or just plain solar cells connected to a PEM electrolyzer.) The idea your championing is, and has been championed already. This research is really piggybacking on an already popular idea, its not like they are the first to try and make hydrogen. This is yet another, and a huge list of processes that are able to produce hydrogen from sunshine in very small amounts. Effort should be put into technologies that already show promise and have been well studied for years. what about platinum and ferritin? They did it with gold, why not substitute the gold with this catalyser and produce some hydrogen? I wonder how assembly could be regulated there.....degredation might be improved if only using shells.